On a seemingly boring, but actually very interesting topic… traffic lane widths. Tonight, we did not have too many dramatic topics, but we had an interesting discussion during our work session on lane widths in residential neighborhoods, and arterial streets. This is a topic was not on my radar until about four years ago when a friend handed me Jeff Speck’s book, “The Walkable City.” Read it. It has heavily influenced our thinking on urban design and traffic analysis. Jeff is a leading new urbanist planner and thinker on street design. He works throughout the US, and has also done work in Cedar Rapids, Des Moines, and some other cities. He visited us last year, but has not formally done any planning work for us. 20 MPH vehicle speed – 9 in 10 chance of surviving. 30 MPH vehicle speed – 50/50. 40 MPH vehicle speed 1/10 chance. We have a lot of posted speed limits where the posted speed not consistent with designed speed. Ex. S. Sycamore – 70 MPH speed design with a 35 MPH. Lower Muscatine 25 with easily 35 to 40. Those speeds arise from wide lanes to facilitate auto zooming. Setting the aside this important safety issue, lane widths also affect – pedestrian use, traffic noise, placemaking, carbon emissions, cycling use, economic development, mode share, and budget (we have had to spend money several times to place speed bumps on roads that were too darn wide in the first place). 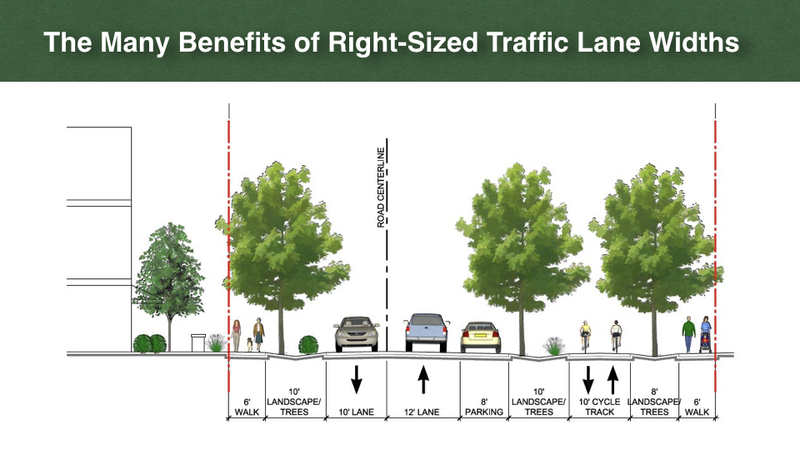 What is residential lane width Nirvana? Longfellow – lane width perfection, room for parking on one side so you don’t even need speed bump. The lane width dictates how fast you can go regardless of posted speed limit. Don’t me wrong, there are several roads – where we absolutely need wider lanes to facilitate volume – S. Riverside, Hwy. 6, Interstate (which are governed by state and feds anyway), but for the most part, 10 feet works, in some times 11, and in very cases, will we need 12′ lanes. Over the next several months our goal is to get our designed standards in line with the actually posted speed limit, which in most cases, is 25 miles per hour. I would like to see 20 max in nearly all residential neighborhoods. None of these changes will be sudden. They will occur after staff, working closely in consultation with other traffic design professionals and in collaboration with the public, makes new recommendations to our council in about six months. Those changes will, of course, provide opportunity for public comment, and speaking at the hearings. We need four votes to move on this. Nothing has been decided yet.